Maple flooring has many different looks, depending on how the lumber is sorted for color and grade. Birdseye is figured wood separated from maple lumber for its small, spotted, three-dimensional grain. Curly Maple is another type of figured maple. Information on curly figuring can be found on the Curly Maple flooring properties page, as it is treated like a separate species. #1 Common Birdseye Maple is custom-made only in a long plank, where the lengths and widths are made specifically to each project’s specifications. The longest lengths can be from 10 to 14 feet, and the widths can be from 2¼″ up to 7″. Moisture content is between 6% and 8% for quick acclimation. Normally, #1 Common Birdseye Maple flooring is only found unfinished, but prefinished solid or engineered can be custom-made with a veneer top layer. #1 Common Birdseye Maple flooring is normally made to order. Custom orders usually demand 2–3 weeks for production, depending on lumber availability. Birdseye Maple is scarce in comparison with other Maple flooring. Pre-milled standard 7-foot bundles are normally not a stock item. #1 Common Birdseye Maple flooring has a pink and white appearance. #1 Common Birdseye Maple flooring will have a 3D spotted appearance with the presence of small knots, worm holes, mineral streaks, and other surface defects. Birdseye Maple is not sensitive to sunlight and will not darken considerably with an oil-based finish. Also, water-based finishes can be applied to slow any color change. 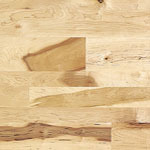 #1 Common Birdseye Maple flooring is durable and resists denting and traffic wear quite well. Birdseye Maple is a relatively stable wood in comparison to species like Yellow Pine but is not recommended for radiant heat applications. Although a hardwood, #1 Common Birdseye Maple flooring works with little difficulty with both hand and power tools. When installing the flooring, it is best to use a manual nailer, but staples and pneumatic nailers work well. Installation is quicker with higher grades of flooring because the lengths of the boards are typically longer. Birdseye Maple holds screws well, and it glues, and polishes to a very attractive finish. It is relatively difficult to sand with flooring equipment because of its tight grain. Staining is very difficult, and “popping the grain” is necessary for stains to absorb evenly into the wood. Grain popping is the process of evenly moistening the surface of the wood to raise the grain for adequate stain absorption. Professional sanding and finishing is strongly recommended. Because of its high price, #1 Common Birdseye Maple flooring is used in high-end residential applications for an elegant floor. It is very popular with wood workers who appreciate the rarity and beauty of Birdseye Maple.